Cardinal Newman has been raised to the altars! He was a brilliant patrologist. He served the Fathers as translator, historian, compiler, controversialist, poet, and even journalist. Reading in the Fathers of the Church, he came to desire the Church of the Fathers. May we all follow him in that, and more. 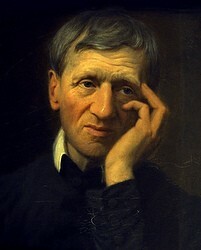 My friend Father Juan Velez and I have compiled a handy, popular devotional way to get to know the new Beatus, our pocket-sized book Take Five: Meditations With John Henry Newman. In holiest wise, and by a bloodless rite. O fire of Love! O gushing Fount of Light! Of their defilement, and again made bright.